In a nutshell, a weed is a plant out of place. This is strictly an anthropocentric definition that means any and every plant can be considered a weed if it is growing in a location where some person does not want it to grow. However, there are special types of weed, often called noxious weeds, that are what most people picture when they think of “weeds”. These are the very aggressive, invasive species that can be so difficult to eradicate once they are established. Invasive species are those that are aggressively expanding the extent of their range, or the area in which they occur. In the U.S. alone, tens of billions of dollars are spent every year on attempts to manage these species because of the significant detrimental impacts they can have on natural ecosystems, nutrient cycles, water cycles, agricultural and horticultural operations, and so on. In the eastern U.S. these are plants such as kudzu, garlic mustard, and Amur honeysuckle. In the West, examples would be spotted knapweed, tamarisk, and cheatgrass. Exotic (a.k.a. non-native, non-indigenous) species were not historically found in the area in question. They may have been introduced to the area from somewhere else for any number of reasons. Some exotic species were introduced to provide wildlife habitat, erosion control, forage for livestock, horticultural purposes, through accidental introductions, etc. Not all exotic species are invasive, and not all invasive species are exotic. Native (a.k.a. indigenous) plants are those species whose natural range encompasses a site in question. Few native species are considered invasive. The ones that are tend to be those that offer significant economic risk, such as plants found in rangelands that are poisonous to livestock. Usually, the terms native and exotic refer to a country or region. We can say a plant is native to Montana, native to the Mountain West, native to the U.S., or native to North America. Most exotic species in North America that are invasive originate from Europe and Asia. Most exotic invasives are also not invasive in their native ranges. There are many theories as to why they become invasive in the U.S., but the one that stands out is that in removing them from their native habitat, they are released from “predation.” In this case, “predation” nearly always refers to a pathogen or set of pathogens that don’t exist in the introduced range. Huge near-monoculture populations covering acres and acres of land don’t just appear one day, although it may seem that way at times. The invasion of a plant species into new areas of range progresses through three phases. In Phase I the species is introduced to an area through some means, and it remains at low population sizes for some undetermined length of time. This is known as the Lag Phase. The lag phase can last anywhere from a few years to 150 years or more, depending on the species and the conditions under which the invasion begins, and the species largely escapes detection, except possibly for the attention of a few experts. However, this point is where control is most easily and cheaply attained. Phase II is the phase of Exponential Growth. At the boundary between Phases I and II the population of the invasive species reaches a sort of threshold where explosive growth becomes possible. This could be the result of a change in environmental conditions, or the species may have been marginally adapted to the site until, after several generations of scraping by, it develops an adaptation to the climate that quickly spreads through the population, allowing it to thrive. Detection of the new invader is more likely to take place early in this phase. Historically, public awareness and concern do not occur until much later in this phase when the species is well-established. As the phase progresses, eradication becomes much less likely and much more expensive to achieve. Figure 7.32: The three typical phases of noxious weed invasion as the invasion progresses over time. Eventually, population growth slows, and the species fills nearly all of the range it can possibly live in under current conditions. The growth curve approaches the carrying capacity for that species in that range. 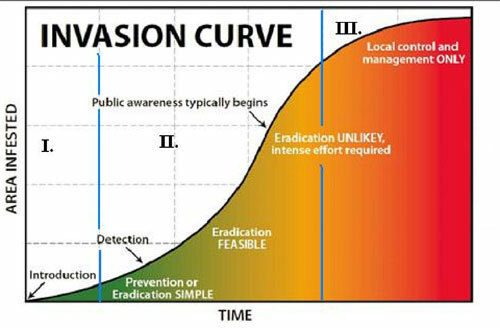 This is Phase III of the Invasion Curve in which the species becomes Naturalized. At this point, eradication is all but completely impossible, and the invasive species is managed as part of the natural ecosystem. So what? Doesn’t the addition of another plant species increase the diversity of the site? In the case of invasive species, the biodiversity of a site usually decreases. Invasive species characteristically form dense populations nearing a state of monoculture akin to a field of crops. The habitat structure is often dramatically altered toward homogenization. The nutrient and water cycling can be significantly changed as well, changing the conditions under which the plant community exists. This, in effect, changes the dynamics of competition between species for that site, resulting in the loss of some species. The degree of possibility for a site to be invaded is referred to as its invasibility and is relative to the potential invaders knocking on its borders to get in. A given site may be more invasible for one potential species than it is for another, and one of the many factors that influence invasibility is the disturbance regime of a site. Sometimes the addition of fire to a system where it has been historically lacking, or the suppression of fire in a system that is fire-adapted, can give a potential invader the competitive edge it needs to become established on the site. Once there, the habitat structure may be changed to the degree that the disturbance regime is changed. Again, this changes the competitive dynamics of the site that could result in a shift in species composition. Aside from changing habitat structure, another mechanism for changing competitive factors is for the plant to alter its environment chemically. When a plant exudes compounds that interfere with the establishment or competitive mechanisms of other plants, it is known as allelopathy, and the compounds involved are known as exudates. Nearly every plant species that has been analyzed for this mechanism has been found to be allelopathic; however, some plants are more strongly so than others. Implicit in the fact that species such as these alter plant communities to a great degree is the fact that they also have significant impacts on the wildlife communities and soil flora and fauna found in an area, and they degrade timber land, range land, water quality, and increase erosion. Crop losses, including timber values, can be enormous. As a result, people spend huge quantities of resources and money on efforts to control invasive populations, so the economic and ecological impacts are vast. Check Your Thinking: If you put 2 plants in the same pot, would they compete more strongly with each other if they were of the same species (intraspecific competition), or of different species (interspecific competition)?